CD review: "Honey Be There"
This review first appeared in the September 25, 1992 issue of the North County Blade-Citizen (now North County Times). 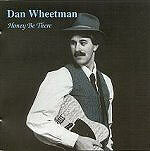 Fiddler, guitarist, harp player, singer, songwriter  there isn't much territory that Seattle's Dan Wheetman doesn't cover. Currently performing in the Old Globe Theatre's production of "Lost Highway" as Leon "Loudmouth," Hank Williams' fiddle player (the play runs through Oct. 4), Wheetman's "Honey Be There" is a rocking, swinging set of warm country originals and covers. The highlights of this, his debut solo recording, include a wonderful reading of Jimmy Martin's classic "Losin' You (Might Be the Best Thing Yet)" Wheetman's version might be better even than Martin's own performance on "Will the Circle Be Unbroken." Wheetman has an uncanny ability to be fully traditional and yet sound contemporary, muck like George Strait or Ricky Skaggs. His songwriting ability  with gems here such as the title track, "Come to You," and "Crying Fool"  places him nearer underground country figures such as Kris Kristofferson and Guy Clark. This CD is a real surprise  a polished, mature effort from an unknown artist unlikely to stay that way for long.